Over the last 40 years, exports account for a larger portion of US wheat production than they do for US corn production. US wheat exports increased rapidly beginning in 1971 and peaked in 1981 at 1.77 billion bushels (Fig. 1, solid blue line). Since then, US wheat exports have declined by 53 percent. One of the debates surrounding agricultural bulk commodity exports has been the extent to which they are affected by changes in the exchange rate. Last week we studied this question with regard to US corn exports and found that there was a correlation between exports and the exchange rates of the international purchasers of US corn (US corn trade weighted exchange rate) in the 1970s, but over time that relationship weakened so that by 1991 there was no correlation between the two. Figure 1. US wheat trade weighted exchange rate for US wheat importers, 2005=100, and US wheat exports (million bushels), 1970-2009. Data source: USDA. 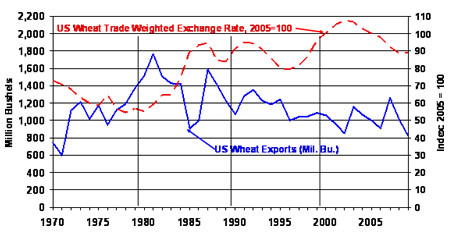 Looking at Figure 1, the expected mirror image between US wheat exports (solid blue line) and the trade weighted exchange rate of US wheat consuming nations (dashed red line) is readily apparent in the 1970-1979 period. That relationship is statistically confirmed (at the 99% confidence level) with changes in the trade weighted exchange rate accounting for 62 percent of the variation in US wheat exports (as the exchange rate goes down, wheat exports rise, and vice versa). The mirror image between the two variables is less apparent in the next period (1980-1989). Again the statistical test confirms (at the 90% confidence level) that the relationship is weaker with changes in the exchange rate accounting for 38 percent of the changes in US wheat exports. Between 1990 and 1999, the two variables appear to track each other rather than being a mirror image of each other. During this period, the results are not statistically significant. But what is interesting is that changes in the exchange rate explain 18 percent of the variation in US wheat exports. However, this time, when focusing on this one aspect, as the exchange rate goes up, US wheat exports go up (counter to what economic theory would predict). In the last period (2000-2009), a statistical test shows no relationship at all between the two variables. All the caveats mentioned in last week’s column still apply. The bottom line is that the apparent declining influence of the trade weighted exchange rate on the volume of wheat exports is similar to what we found for corn. In the 1980s, claims by analysts that exports of corn and wheat are affected by changes in the exchange rates of the international consumers of these products are well-supported by the data. With passing of time however, this explanation for the variability of US corn and wheat exports has grown weaker and weaker to the point that one can no longer discern a relationship between the two in recent years. On a given day, there may be the appearance of a correlation between corn or wheat exports or anticipated exports with the exchange rate for the US dollar, but over the period of a year, that is using annual data, the relationship has not been significant for last decade or longer. Much of the today’s export-centric narrative in agricultural circles focuses on exchange rates and market access. As US agricultural interests talk about increasing US exports of corn and wheat they will need to talk about more than exchange rates. And if we are correct about what makes crop exports “tick,” they will need to talk about more than market access as well. Larger factors that we have discussed in previous columns are at play in influencing US corn and wheat exports; a few of which include: the spread of agricultural technology around the world, the availability of additional crop acreage in other countries (particularly our export competitors), and the inclination of leaders of other countries to view food production as a matter of national security.